Tanya McGill, Orkney Islands Council. "I really welcome the genuine opportunity the Skoogs provide us to extend our instrumental service and be fully inclusive." "A new instrument for established musicians, and new ways for all to play." "...one of the most exciting technological developments for disabled children and adults of any age, for some time." "[The Skoog has] transformed the life of one young girl at our school in particular. On the autism spectrum spectrum with limited speech, she struggles to cope in every area of the curriculum. However, when she plays the Skoog, she becomes graceful, confident and at ease with herself. It's wonderful to watch." "Skoog is an essential part of my music kit, as it can provide variety in group music sessions, encourage and enhance individual creativity, and most importantly, it is great fun to play!" "The Skoog, though silly and fun loving on the outside, contains within it the serious potential to turn anyone into a musician and enjoy the satisfaction of musical expression." "intended to bring music-making to people of any ability - or disability." "Ideal for children or those unable to play normal musical instruments, the Skoog lets you make music by prodding, twisting and thwacking. It’s wipe clean, too." Guitars can be difficult to play, but Skoog and Skwitch make it fun and easy to get started. Join a band or make music with your friends. You can play Skoog and Skwitch with any part of the body; hands, elbows, feet – this means everyone can join in. Explore our online support section for a range of free resources, from lesson plans to fun activities. Or visit our blog to find out how musicians from all over the world are using Skoogmusic products. Skoog is compatible with other apps like GarageBand and Skwitch works as an MPE/MIDI device. It’s easy to get started and use Skoog and Skwitch in all your music making activities. For users with speech or language barriers, Skoog transforms into a communication aid with our free app, Skoog Access. Skwitch enables you to take full control as you navigate your iPhone or iPad using your Skwitch device and Skwitch Access. Just tap or press your Skoog or Skwitch and you’re up and running. 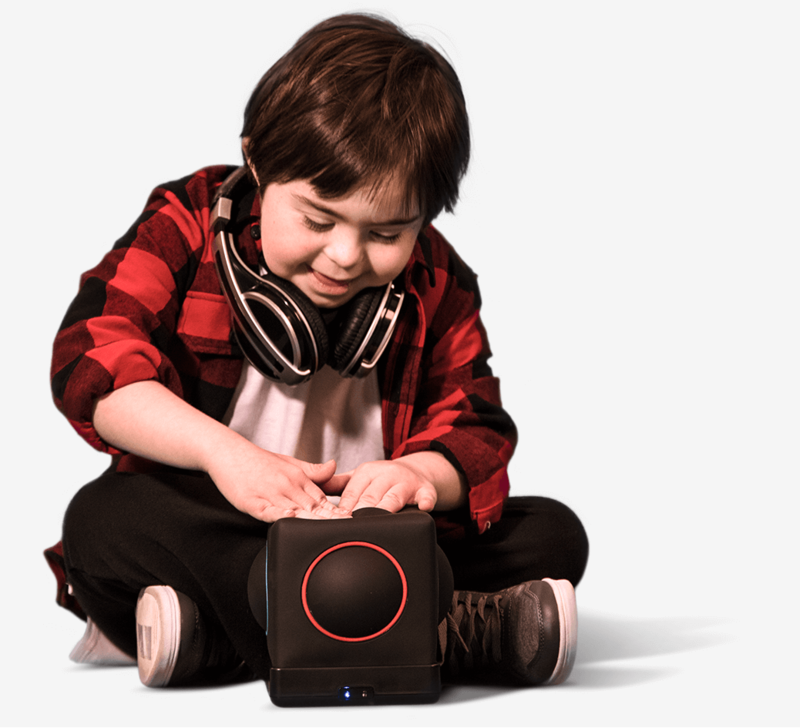 Skoogmusic’s user-friendly design makes Skoog and Skwitch fun, inspiring and easy to use. So children, parents and teachers really get to express themselves – including those with disabilities. Become a Skooghero! It’s fun, easy and incredibly rewarding! Creativity is having fun. At Skoogmusic, we want to make learning fun for all. Skoogmusic is committed to enhancing the educational experience of young people and we want you to help us achieve that. If you are an educator or involved in education you could become the next Skooghero. Sign up to become a Skooghero today. Buy Skoog 2.0 from Apple or Amazon and now John Lewis. You can buy online or find an Apple store in your area. For more ways you can see, feel, squeeze and buy a Skoog visit our Where To Buy page. You can purchase Skoog 2.0 for £179.95. For schools looking to purchase Skoog via purchase order, find a dealer in your area here. You can also buy from Apple online or instore. For more information about our educational resources get in touch today. Skoog’s origins lie in research pioneered at the University of Edinburgh led by Professor Nigel Osborne. In collaboration with The Tapestry Partnership, the researchers engaged in extensive consultation with schools between 2003 and 2005, identifying music as a tool for improving learning engagement in children, particularly those with profound physical and learning challenges. With support from NESTA the team set out to create a new instrument that was truly inclusive. You can find out more about the history of Skoog here.